By the grace of God I’ve been a Catholic all my life, and during these decades, I’ve known and observed many priests going about their duties. One of the most fascinating differences among them is how they bear themselves before and after Mass. It took me a long time to realize how great an impact for good or for ill this can have. Tearing us away from the secular world and thus from the temptation of immanentism, [the liturgical rites] have the power to immerse us suddenly in the Mystery and open us to the Transcendent. 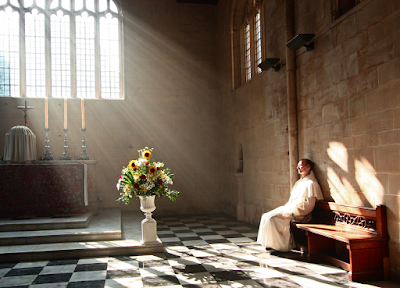 In this sense, one can never stress enough the importance of the silence preceding the liturgical celebration, an inner narthex, where we are freed of the concerns, even if legitimate, of the secular world, in order to enter the sacred space and time where God will reveal his Mystery; one can never stress enough the importance of silence in the liturgy to open oneself more readily to the action of God; and one can never stress enough the appropriateness of a period of thanksgiving, whether integrated into the celebration or not, to apprehend the inner extent of the mission that awaits us once we are back in the world. Consider first the time before Mass. Shawn Tribe wrote an article here a number of years ago that deeply affected me—an article urging the recovery of a spirit of reverence, respect, and quietude in the sacristy before the celebration of Mass. He noted that many sacristies have a sign reading SILENTIUM, and recalled the very old custom of the priest reciting hallowed prayers as he dons each separate garment in preparation for offering the Holy Sacrifice. Before a High Mass, a Solemn Mass, or some other major liturgy the platoon of servers will be very busy, but there is no reason why they can be quietly busy, learning to move in an atmosphere of prayerful preparation and anticipation, keeping their voices down and their conversations useful to the matters at hand. The holiest priests I’ve known (although there are exceptions to any rule) have tended to arrive in the sacristy early so that they could prepare in an unrushed spirit. I have noticed that they would carefully say the vesting prayers and be ready, waiting, often looking at a wall-mounted crucifix, before the servers had finishing pulling themselves together. When the bell rings or the clock strikes, such a priest is ready to process in, with a “Procedamus in pace” on his lips. What a profound “ripple effect” his earnest, calm, and focused mind can have on the entire sacristy atmosphere, and on all who are working in it! Contrast this with the priest who rushes in at the last minute, in a whirl and a tizzy. He’s looking here and there, maybe stealing a quick glance at the Ordo, racing against the clock. He throws open the closet and grabs the alb and the chasuble, scarcely taking time to straighten them before walking out into the church. Where is the “dutiful preparation” of Canon 909? Do the servers imbibe a true spirit of reverence towards this most awesome of all human actions—indeed, do they see that the priest is embarking on a divine action of which he is, and they are, totally unworthy, and before which we stand in fear and trembling? Or take the other contrast, Father Foghorn, whose arrival everyone knows because you can hear him yacking away in the sacristy before Mass, about the weather, or football, or something in the news, or someone’s sick aunt, or whatever the topic du jour may be. Indeed, he might even be giving out commands about liturgical preparations, but the generalissimo manner is enough to debar anyone from prayer. The truth is simple: Father Foghorn and Reverend Roadrunner are not edifying. We need clergy who, before Mass, conscientiously pursue the spirit of recollection, prayerfulness, humility, and peace. At the end of the day, this is not merely for the benefit of a bunch of rag-tag servers or half-asleep pewsitters; it is for the benefit of the clergy themselves, who stand to win or lose their vocations based on how they approach the very work for which they have been set apart. The devil, shall we say, never omits to prepare for whatever dark business he has in hand, and it seems he targets those who have forgotten their dignity. We must not omit to prepare ourselves for ascending the mountain of the Lord in the company of the angels. Let us turn to the time after Mass. Although I don’t remember ever seeing this custom while growing up in a mainstream American parish in the 1970s and 1980s, I began to notice in college and afterwards that more conservative or traditional priests, having returned to the sacristy, would say “Prosit” and then give a blessing to the kneeling altar servers. This is a laudable custom that surely deserves to be retained wherever it exists or revived wherever it has fallen into desuetude. But what should happen next? The best way I can answer that question is to describe a particular priest friend of mine, whose example in this regard was as luminous as can be. After blessing the servers, he would quietly divest (no indulging in sacristy banter and very little of the “post-game debrief”), and then immediately step out to the sanctuary, kneel on the side, and pray for several minutes. He sometimes used the traditional prayers of thanksgiving from the Missale Romanum, other times not. It was clear that he was not doing this to be seen by men, yet everyone saw him nonetheless—and this is as it should be. The priest who offers the Holy Sacrifice of the Mass, the most sublime act of worship on the face of the earth, the ecstasy of angels and the terror of demons—how can he possibly return immediately to secularity, light chit-chat, text messages, voicemails, or emails, or rush away to do something else (unless it is a genuine emergency)? The holy priest just described is the polar opposite of the priest who seems unable to get away fast enough when Mass is over. He zips out of the sanctuary or nave (depending on the planned or available route of escape), whips off the garments, and is out the door quicker than you can say: “Father, do you have a minute to hear a confession?” To a layman, this is a dismaying experience. I was taught in grammar school to stay a bit after Mass and make thanksgiving. Why isn’t our priest, our leader, doing the same? We always say that example speaks louder than words. Then there is the priest who obviously thinks that the time after Mass is created for socializing, often at great length, in the atrium or right outside the main doors of the church. I’m not saying that greeting people, shaking hands, and asking “How’s your mother doing?” or questions of that sort is a bad idea; in fact, on Sundays it seems to be an especially good opportunity for making the sort of “horizontal” connections that ought to be avoided during the Holy Sacrifice of the Mass itself. Nevertheless, when the post-liturgical bonhomie is conducted with such vim and vigor that the faithful who are trying to pray in the church can hear the guffawing and backslapping pouring through the entrance, or when the extent of the socializing crowds out any real prayer of thanksgiving on the priest’s part, we are dealing with a mixed-up sense of priorities. As a parting thought, the impression has grown on me more and more over the years that one of the strongest merits of the usus antiquior is that it has preparation and thanksgiving already “built in.” Yes, there is still a brief period for each in the Novus Ordo, but nothing comparable to Psalm 42 and its accompanying versicles and prayers, or to the Placeat and the Last Gospel. One feels that one has decisively begun and decisively ended. There is a suitable psychological and spiritual transition from the secular world to the sacred, and again from the sacred to the secular. And yet, paradoxically, it is among usus antiquior-celebrating priests that I have tended to find the greatest recollection and prayerfulness before and after Mass, too. What this suggests to me is that the very reduction of the rituals of preparation and thanksgiving within the Ordinary Form has had a bleed-over effect on the time before and after the liturgy itself. This is why we should adamantly oppose any “reform” of the 1962 Missale Romanum that involves the abolition of the prayers at the foot of the altar and the Last Gospel. Those who speak of the value of the 1965 Missal—the supposed implementation of Sacrosanctum Concilium—as if it’s the fulfillment of legitimate liturgical reform are not thinking carefully enough about why these introductory and conclusory parts became popular in the first place and why, under the influence of the Holy Spirit, they were eventually integrated into the liturgy.